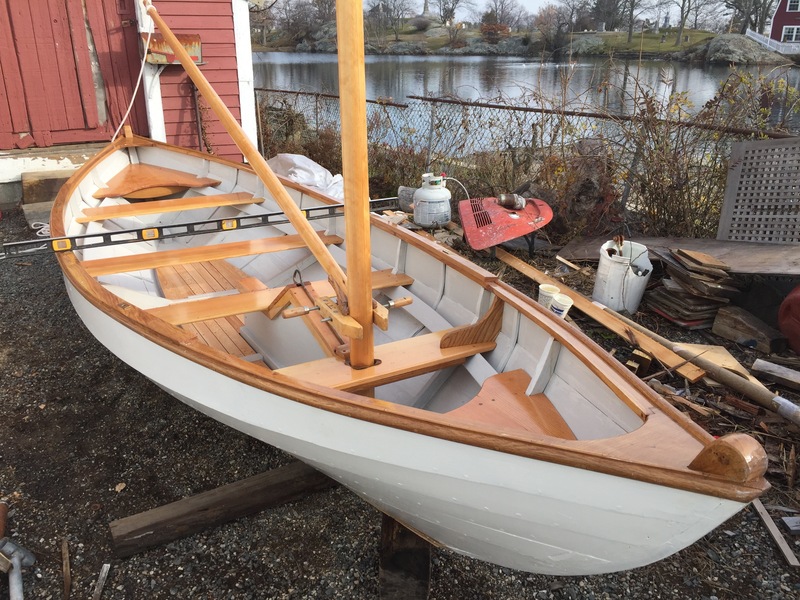 This boat was built new in the fall of 2016 to designs found in John Gardner’s Dory Book. I used the lines of Gerald Smith’s 17′ version he adapted from the original Chamberlin molds that he had acquired. Working with the owner I developed a mix of details from a number of dorys to make sure he had exactly what he wanted. 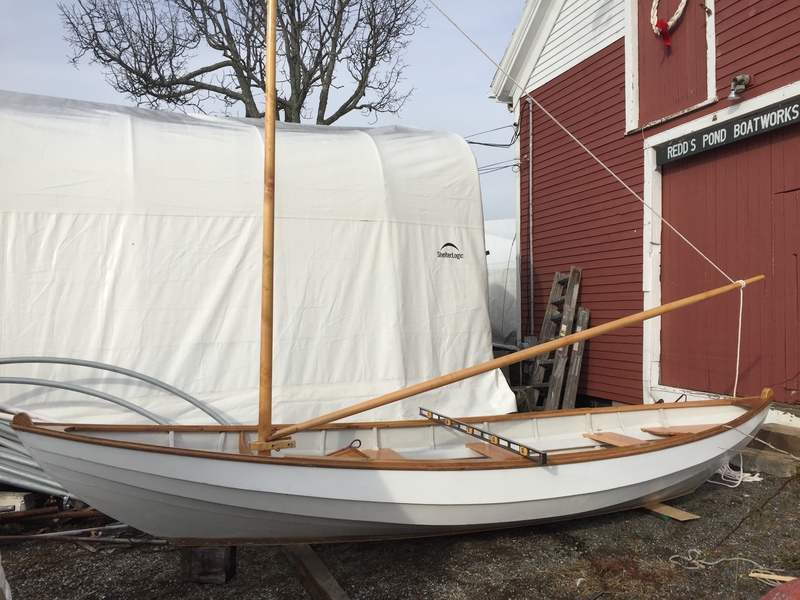 We also added an adapted version of the Beachcomber dory rig John Gardner presents in the 19′ Marblehead Gunning Dory. 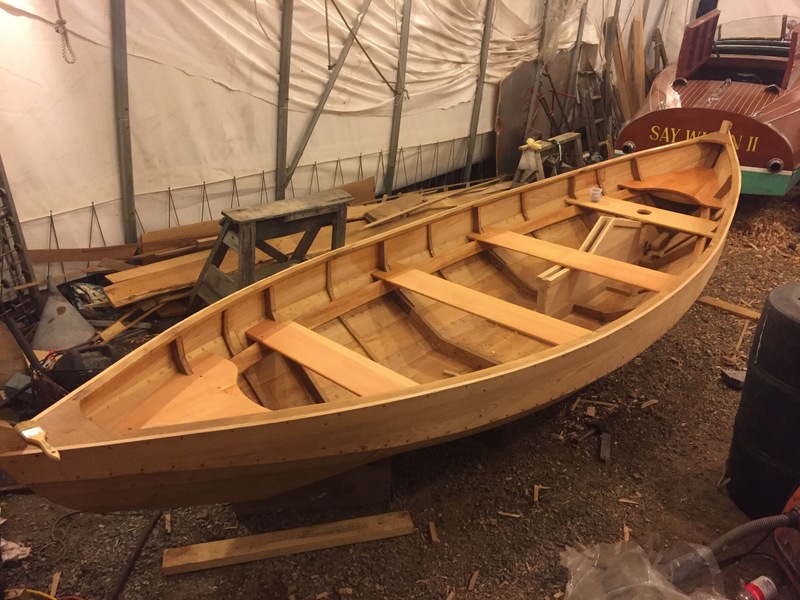 The hull is planked in cedar, the stem, sawn and bent frames, and inwale and sheer cap are of oak. Copper rivets and bronze screws. The rig is solid sitka spruce. 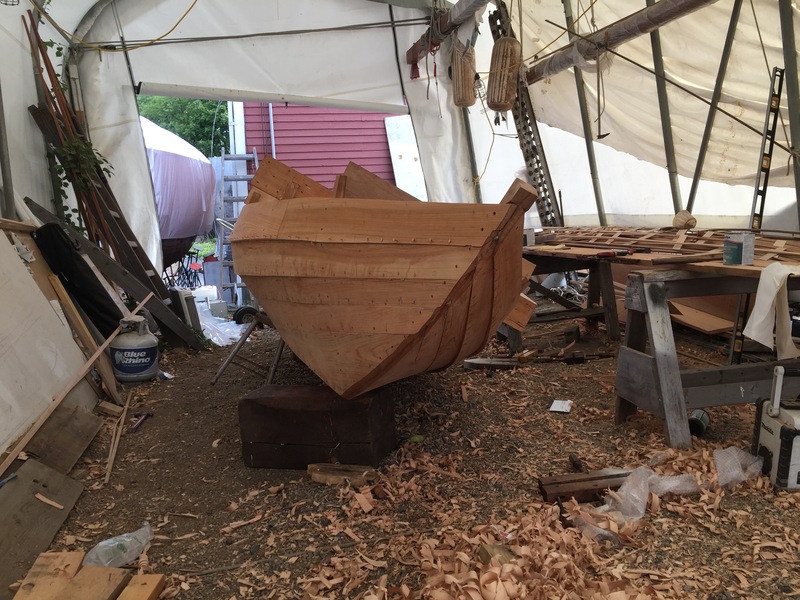 Below is a brief description of our dory building process for this boat. 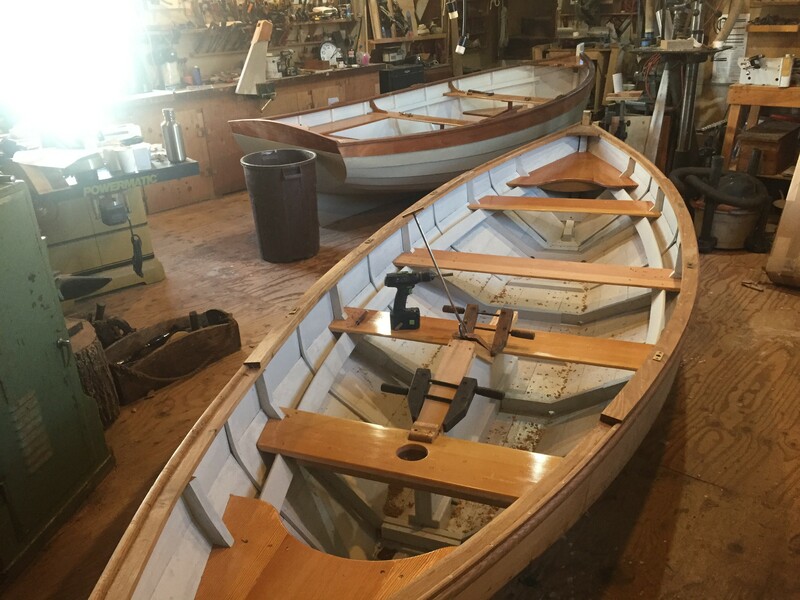 First, here is the bottom board made up with each station’s frame fastened on along with bow and stern stems and bottom board cleats. 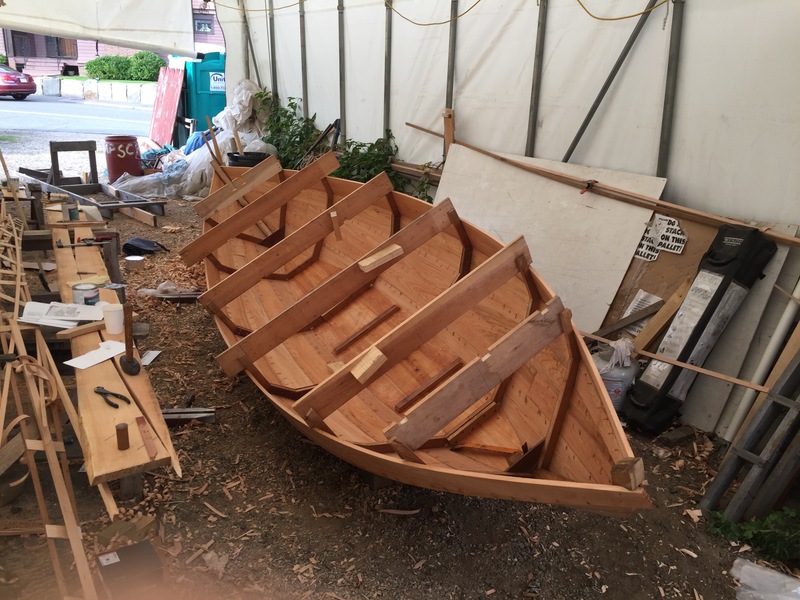 I Then flipped this assembly over onto a sturdy building jig which allows me to both plank more comfortably and hold the boat to shape while I bend on the planks. Here is the boat right after being flipped off of the planking jig. 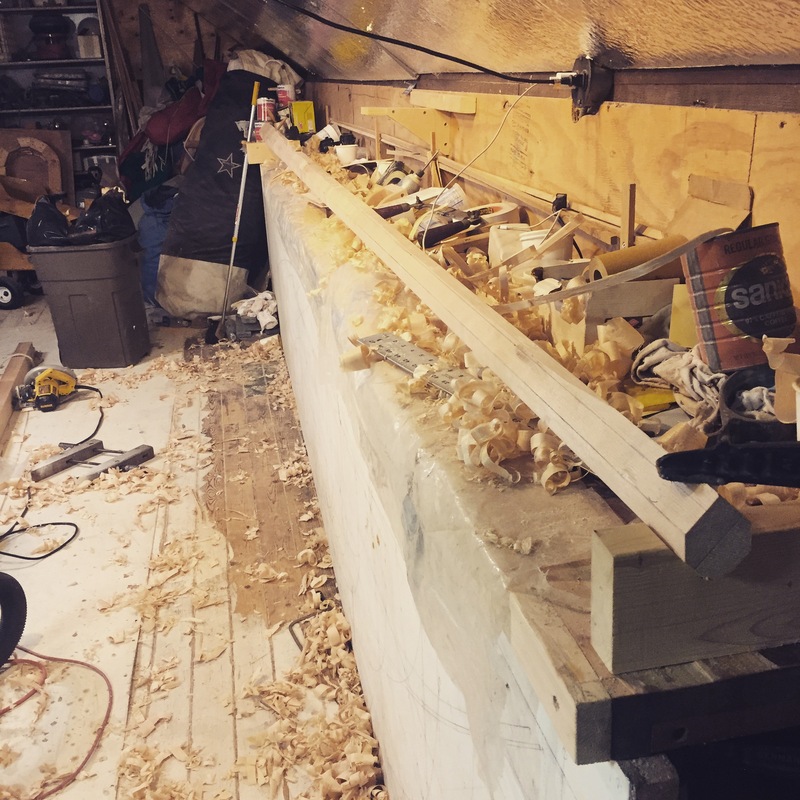 I leave the frames extra long to make sure that the boat holds it correct width at the stations and each cross brace is made specially so that the bottom board has the right amount of camber in it. Lucky to get some VERY clear cedar from Florida for this boat. This photo is taken while the seams are riveted tight to keep the hull water tight. Once riveted I moved on to seat risers and thwarts. These enabled me to remove the cross braces and install the inwale to stiffen up the sheer plank. 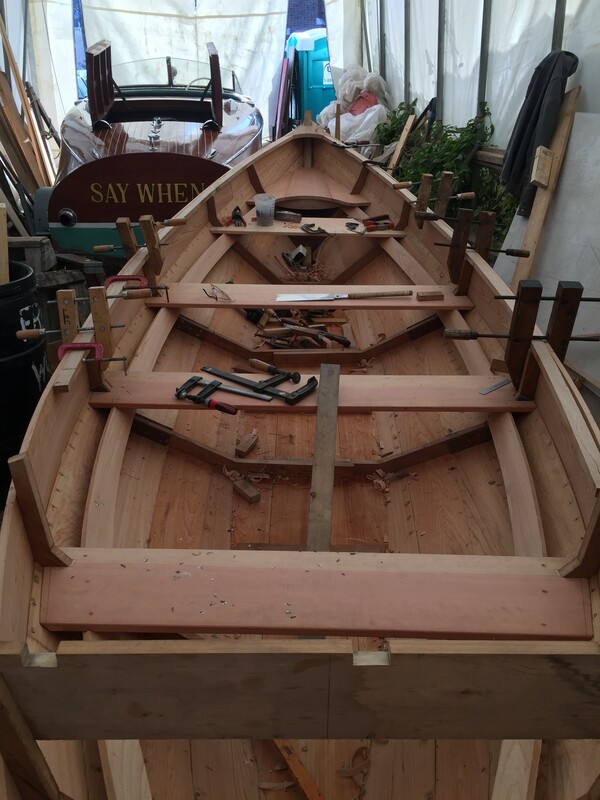 Once the inwale was installed I removed the thwarts and seat risers again to install steam bent frames between the sawn frames and the centerboard trunk. 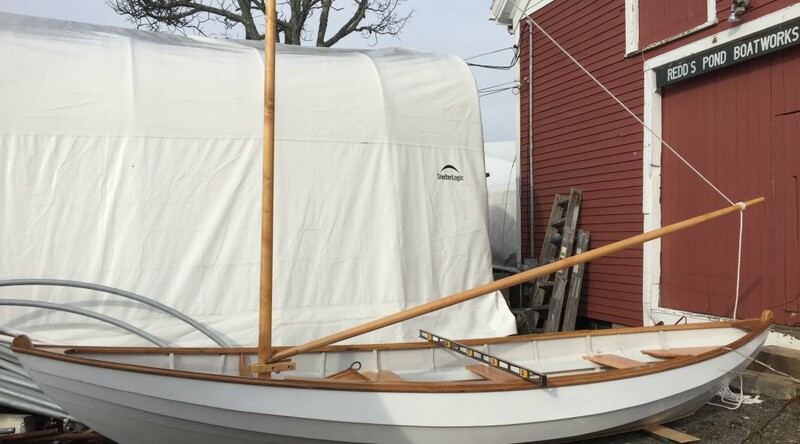 The hull is coated in Linseed oil based Varnish and paint allowing good protection while moving with the seasonal dry/swell cycles. Here the centerboat trunk cap is being fit with the bronze rod centerboard lifing bar. 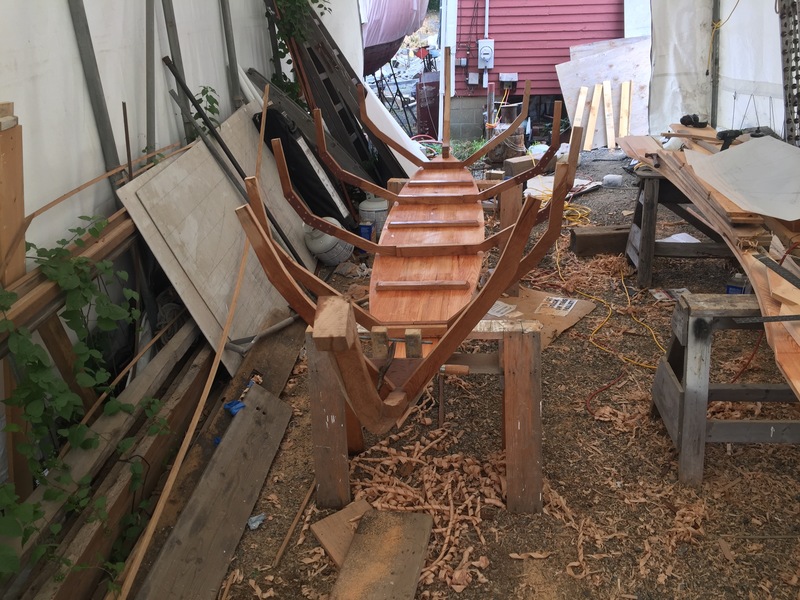 The spars are made of 2 face glued pieces of sitka spruce. By inverting two pieces of the same board you can achieve a much more stable spar as the tensions in the wood can counter-act each other through the seasons. Here I am cutting down the squared adn tapered stock to 8 even sides, before 16 and then 32 sides before being sanded to a smooth round. Now with the hull coated, the rig finished and varnished final rig details are completed. Mast partner knees, boom jaws, leathers on all chafe points. removable sole boards, stem fittings for the jib, oar lock sockets, etc. The beachcomber rig has a great look! I can’t wait to see how she rows and sails. 12 1/2 "Best Day Ever"